Simon is abducted by a masked man and driven to an unknown location. He’s shown an atomic bomb and the man tells him (via pre-recorded taped messages) that unless his demands are met the bomb will be detonated in the heart of London. The mystery man’s demands are quite simple – he wants Lynn Jackson (Anouska Hempel) to be guillotined in public. He gives Simon and the authorities until early evening to accede to his request – and in order to prove he’s serious, a conventional explosion will be set off every hour, on the hour …. The Armageddon Alternative is a somewhat flawed story and the flaws are apparent from the pre-credits sequence. Why does the masked man never speak? The logical answer is that he’s a member of a team and the taped messages were recorded by somebody else. Alas, logic has rather taken a holiday in this episode. Simon later explains that the voice was recorded in order to disguise it (otherwise he would have instantly known who it was). But that makes no sense – as soon as we hear the tape it’s obviously George Cole putting a funny voice on. 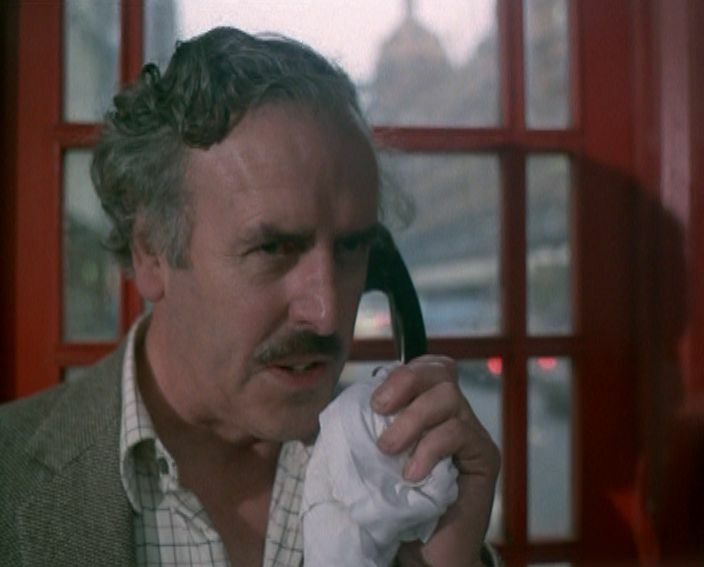 And when we see Fred (George Cole) a few minutes later it hardly takes a nuclear scientist to put two and two together. Fred looks after the cars in Simon’s block of flats and is clearly the last person in the world you’d assume would be in possession of an atom bomb or have the skill to use it. The mid episode reveal that he’s responsible should be a shocking twist – but it’s no surprise at all. This possibly isn’t the fault of Terence Feeley’s teleplay though. He would no doubt have assumed that director Leslie Norman (father of Barry) would be able to effectively disguise Cole’s voice. What is a mystery is why Fred should want a gorgeous young woman like Lynn executed. Although when it’s revealed that her father, Professor Loder (Frank Gatliff), is the Government’s chief psychiatric vetting officer, things begin to fall into place. It seems obvious that someone who Loder filed a negative report against has decided to take the most drastic of revenge. A likely suspect is Parkinson (Gordon Gostelow). He turns out to be innocent, but takes a perverse delight in stringing Simon and the police along. It’s a nice cameo from Gostelow who plays unhinged very well. 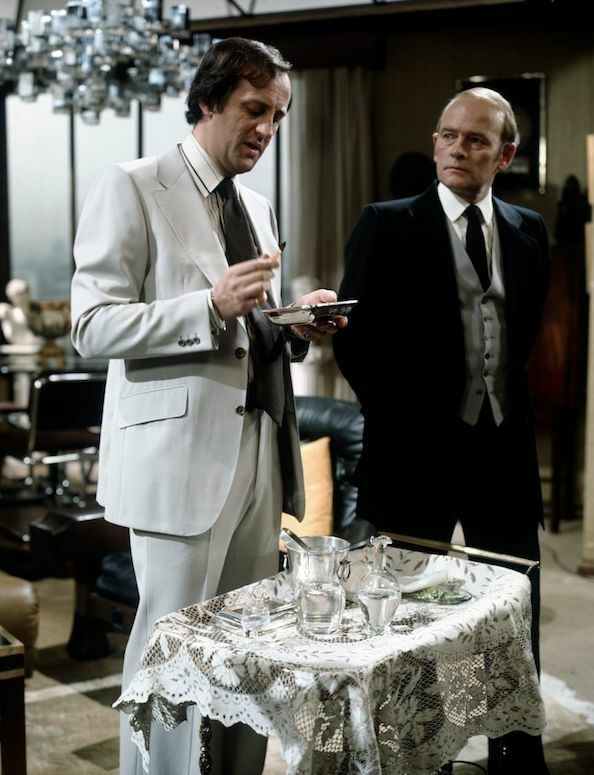 Indeed, the cast here is very strong – George Cole is his usual dependable self, whilst Anouska Hempel is also very watchable. True, she’s not the strongest-drawn female character that ROTS has ever offered us, but Hempel manages to make something out of nothing. Although laughs are thin on the ground, there was one (although I’m not sure whether it was intentional). When Simon is kidnapped, he asks the man a question and amazingly the next thing on the tape is an answer to the question! This is either an incredibly sloppy piece of scripting or a good joke. It does rather bring to mind the Monty Python sketch featuring Michael Palin as a barber who has an uncontrollable fear of cutting hair though. Great cast, but as the identity of the bomber is blown before we see the opening credits I can only give it two and a half halos out of five. Although not as familiar a name as, say, Brian Clemens, Roger Marshall is something of a British television drama legend. He co-created Public Eye and wrote many of its best episodes (including all of the first Thames series). During the 1980’s he created and wrote two well received series, Travelling Man and Floodtide. He was also very adept as a writer-for-hire, crafting quality episodes for programmes like The Avengers, Van Der Valk and The Sweeney. Another outstanding Marshall script was provided for series two of Survivors (Parasites, tx 2nd June 1976). Having said all this, I can’t put my hand on my heart and claim that Zodiac (which he created and wrote three of its six episodes) is a highlight on his CV, but it does have its moments – mainly thanks to the lead performances of Anouska Hempel and Anton Rodgers, some witty dialogue and a number of quality guest stars. 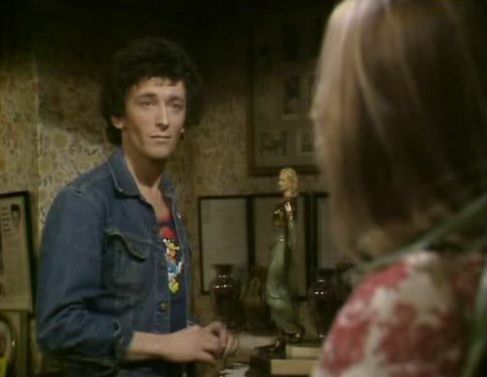 Rodgers is David Gradley (a most unusual policeman) and Hempel is Esther Jones (an astrologer) and together they solve crimes that hinge, more or less, on the signs of the Zodiac. Alas, it seemed that public and critical indifference ensured that they only managed to cover six of the twelve signs. The opening five minutes of Death of a Crab could be seen as an exercise in testing the patience of the audience. Since it’s a new series, you might expect a good, swift hook to capture their attention – instead we see Parker (Peter Childs) making himself at home at the luxury penthouse apartment owned by Aikman (John Rhys-Davies). Aikman isn’t there, but he’s left a recorded message inviting Parker to treat the place as his own. So Parker wanders about, examines the fixtures and fittings, pours himself a drink, has a cigar, draws a bath and settles down to enjoy his scotch. By now, five minutes have elapsed – but just before you wonder exactly when the story will start, Parker slumps in his chair, unconscious. Next morning, the maid discovers his dead body in the bath and the police, in the form of Gradley, are called. Whilst this has the hallmarks of a police series (with a mystical edge) one thing that’s missing are (with the exception of Gradley) the police. Unusually, he’s the only representative of the force we see. He doesn’t have a sidekick (something later mentioned by Esther) and there’s no sign of fingerprint or forensic officers at the scene of the crime either. The clash between the rational police procedure of Gradley and the mystical intuition of Esther is obviously one of the series’ selling points, although the elements do sit rather uneasily together. If the series had run for longer then maybe Esther’s skills could have been integrated better into the stories – on the evidence of the first episode she tends to deliver uncannily accurate predictions based on people’s astrological signs with the occasional leap into the unknown. Having somebody with that level of insight does create problems in telling a straightforward story – if the writer’s in a hole, then it’s tempting for Esther to have a vision and provide Gradley with previously unknown information. The revelation that Esther was married to Parker does (briefly) make her an object of suspicion – but to be honest, this is a murder mystery with only one suspect. That does sap a little of the interest, but Hempel is gorgeous and Rodgers is amusing, and their witty byplay is good enough to keep this viewer interested.